In the first creation story we hear about speaking creation into being, “God said…and there was.” But here we see God forming man out of clay. If you’ve ever made anything out of clay you know how physical and involved that process is. God didn’t merely call man into being, He crafted man with His hands. Then God got right into man’s face and breathed life into his nostrils. That’s how close God was to man. But, as we will hear on Friday, man rejected God. Adam and Eve used the incredible freedom God had given them and rebelled against Him. And it’s at that moment that death became apart of man’s reality. God didn’t curse us with death because of sin, rather, we chose death. When we rejected God we rejected the very life He breathed into us, we chose not-life. So God banished Adam from the Garden and, “stationed the cherubim and the fiery revolving sword, to guard the way to the tree of life” (Gen 3:24). Note that the tree of life is not the forbidden tree of the knowledge of good and evil. Before they sinned there are no reasons to think that Adam and Eve didn’t eat freely from the tree of life, but now access to the tree has been severed. Mankind was separated from that fruit for thousands of years. Then God sent us a New Adam to undo the sin of the first. Christian tradition recognizes the cross as the tree of life. A device that symbolized suffering and death, the worst effects of sin, was transformed into the image of salvation. And the fruit of this new tree of life, the fruit God sent angels with flaming swords to guard, is the very flesh of God: Christ’s body and blood, the Eucharist, the source of Divine Life. Then on the very day of His resurrection Jesus, the first day of the New Creation, the Son of God, once again breaths on mankind. “On the evening of that first day of the week, when the doors were locked, where the disciples were, for fear of the Jews, Jesus came and stood in their midst and said to them, ‘Peace be with you.’ When he had said this, he showed them his hands and his side. The disciples rejoiced when they saw the Lord. [Jesus] said to them again, ‘Peace be with you. As the Father has sent me, so I send you.’ And when he had said this, he breathed on them and said to them, ‘Receive the Holy Spirit. Whose sins you forgive are forgiven them, and whose sins you retain are retained’” (John 20:19-23). Where the first Adam rejected the breath of life through his sin, the New Adam breaths divine life, the very power to remove sins, on His apostles. The death and resurrection of Christ is the great reversal of the Fall. As a final reflection, I would like to draw your attention to the image at the top of this article. It’s a painting by Rembrandt titled, “Christ and St. Mary Magdalen at the Tomb.” Notice a couple of things. First, drawing from John’s Gospel where Mary Magdalen mistakes the resurrected Jesus for the gardener, Rembrandt depicts Christ with gardening tools. The God who tilled the Garden of Eden is now dressed as a gardener on the first day of the New Creation. And the angels, the ones God had sent to the tree of life with flaming swords, their job is done. They can relax and lounge in the garden. The tree of life is open again. 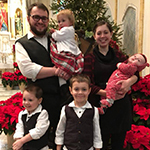 Paul Fahey is a husband, father, and a parish director of religious education. If you like what he has to say, read his work at Where Peter Is, check out his blog, The Porch, or follow him on Facebook.